In our first episode of the new academic year, Paul went to speak exclusively to Ross Morrison McGIll you may well know better as Teacher Toolkit. Ross announces that his situation has changed radically. He has resigned form his job as a teacher and has decided to move into providing the training he has been asked to do in schools by so many people for such a long time. He also plans to continue writing books and provide other kinds of educational consultancy. Incredibly, he is already taking bookings up to 2019 and is very much looking forward to this new challenge. Ross says he will miss a lot of the usual activity he has been involved in for so many years but he is pleased he is still going to be heavily involved in education. Being freelance, he is looking forward to being able to speak more honestly and openly about his educational beliefs and the things which have happened to him personally. 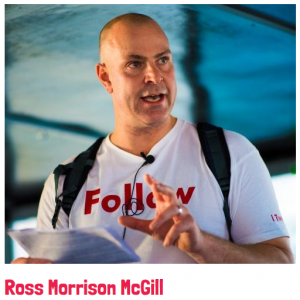 For a long time, Ross has been developing ways to manage the amazing growth of his blog and other activities as Teacher Toolkit. He had to bring in other people to keep the blog going because it grew to have an incredibly large following, for example. Ross thinks there must be more than a quarter of a million followers across all the different Teacher Toolkit platforms and online activities, and the website requires a lot of funding, development and management to keep it going. This was getting very difficult to keep up with as a full-time deputy head in a challenging school. Ross was receiving amazing opportunities across the world to deliver training which he was unable to fulfil due to his teaching commitments so, despite bringing in additional people to help manage the Teacher Toolkit activities, he has found it increasingly difficult to manage, which has had an impact on his well-being, mental health family and job. At the same time, Ofsted came into Ross’ school and decided that it needed to be in Special Measures. This is despite a lot of schools Ross knows using aspects of what his school was doing as a template to help develop their practice. He believes that the data didn’t meet Ofsted’s benchmarks and that was the basis of the methodology for the rest of the inspection process. He believes the school is really borderline good with some very challenging behaviour and he questions how the inspection was carried out including inspectors having private conversations with students and asking what he describes as ‘leading questions’. Despite all the issues, Ross is still very sad to leave the school. He has always been drawn to working in challenging schools but he has serious words of warning for other teachers who choose this rewarding path. If you choose to work in a challenging school, you have to accept that at some point it’s going to come back and bite you. He was made redundant from his first challenging school and now, despite his efforts, his school was put into Special Measures and a lot of other management decisions were made which he didn’t think were right. Alongside the major changes for Ross, his wife, Jenny, has also resigned from her head of department teaching job and has started to work as a seamstress and designer alongside supporting the Teacher Toolkit developments as Co-Director. She is very talented and is enjoying a lot of media and professional attention for her artistic endevours. 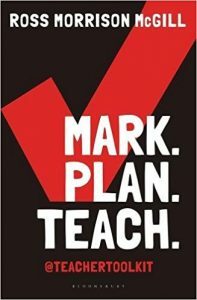 As part of the new venture, Ross has a new book coming out on 7th September called MARK. PLAN TEACH. on which he has worked with psychologist Dr. Tim O’Brien (find Tim’s interview on the Pivotal Podcast here). Ross has developed a series of CPD events connected to the book which they are presenting around the country this academic year. They will be presented by Ross, Tim and Tom Sherrington. Find out more about these training opportunities here.